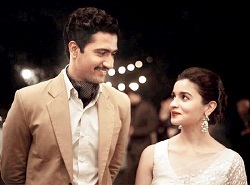 It looks like for Alia Bhatt the going is good; her latest release ‘Raazi’ a spy thriller by Meghna Gulzar is a serious movie but moves a tad slow, in my view. The film is said to be based on Harindar Sikka’s novel (written based on the events before the 1971 India Pakistan war) titled ‘Calling Sehmat’. The book has been inspired by real life events at that period. Sehmat is a young girl in college, is forced in a way by her father a patriot in India to enter Pakistan as a spy. She was trained for that and was married off to a Pakistan army brigadier’s son purposely whose sons also serve in military. Sehmat after marriage moves to Rawalpindi and successful in laying her hands on a secret plan of Pakistan to attack an Indian ship (INS Vikrant) in the Bay of Bengal. In her mission, Sehmat without raising the doubts of her in laws’ and of husband Iqbal, kills the loyal cook in the house and her brother in law. But, when Iqbal identifies her true color she makes an escape. Iqbal gets killed in the melee and Sehmat is pregnant. In the end an aged Sehmat is shown sitting in a desolate room and she had given her son also for the service of he nation. The closing card says that there are many unsung souls who have sacrificed their lives for this nation. True, but the problem is neither the leaders nor the public ever seems to have realized that sacrifice today. I find Alia Bhatt is one of the most dependable and versatile heroines today; she carries of any role be it silly or serious with great ease and elan. Viky Kaushal as her husband Iqbal Syed plays his part with great dignity. Meghna Gulzar’s direction is, indeed, commendable. I understand this film has turned out to be a success; surprisingly on a working day even in Escape’s Carve the small auditorium was full. Well, I think it deserves the attention.